This expansion for the tinker clocks in at 7 pages, 1 page front cover, 1 page SRD, leaving us with 5 pages of content, so let’s take a look! As the pdf observes, this pdf offers options for lower levels tinkers – though this time around, a minimum of 3rd level to get properly started. 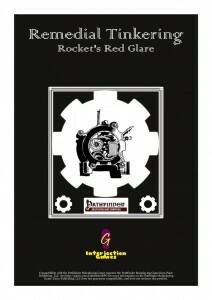 It should also be mentioned that this pdf links up with rules in the SUPERB tinker-expansion Happy Little Automatons, which every fan of the class should have. We have three new invention types herein – compartments and fireworks. Compartment inventions are introduced to streamline the compartment-questions provided in previous installments that featured some sort of fuel/etc. Fireworks-inventions are special inventions that occupy space in a given compartment as though they were goods – they thus need compartment space and may, important, NOT be launched by hand, only by the respective invention. Fireworks have a range of 30 ft., max 150 ft. and they are executed against grid intersections (AC 5) and may target occupied and unoccupied intersections, thus deviating from splash weapons, though occupied intersections are treated as ranged fire into melee, including potential for penalty negation via Precise Shot. Intersections sans walls etc. also have their AC increased. On a miss, we determine how it missed, also providing concise rules for determining z-axis issues when shot into the air (or into a pit). Finally, there would be propellant inventions, which modify all fireworks in a given compartment at the time of deployment; only one propellant can be added per compartment. All right, got that? We thus gain 3 new innovations: One that negates the chance of fireworks exploding when going unlaunched, one that increases capacity of all compartments by +1 as though they were improved compartments for the purpose of holding different substances and one that lets you break the “only one propellant”-rule and allows you to add 2 in a single compartment. And then, we have inventions – and at this point, anyone who has ever made a tinker starts cackling with glee, mainly because the by now beautifully customizable system benefits from the expansions made so far: Take e.g. Alphas that contains vast amounts of fireworks that furthermore has an increased propellant capacity, increasing the value of the fireworks stored by the alpha. The base for fireworks would be firework tubes or hot pockets, reloading from a chosen compartment as a move action, launching them as a directed attack, with potential options to fire multiple fireworks and synergy with Rapid Reload and Rapid Shot. Hot Pockets may be used to prime fireworks and fire them all at once as a directed attack, though primed fireworks continuously decrease their maximum range and may even explode in the automaton if the tinker fails to direct the attack, making the base system work essentially like a pretty interesting game of action-economy conversion and set-ups. And yes, e.g. The Late Bloomer can be used to increase the radius of launched fireworks, while a propellant may be added to increase the range of fireworks – a potential synergy with another range-increasing tube-modification. Even general fireworks end up having something interesting going for them, with AC-penalizing caustic fireworks, propellants that may dazzle those adjacent to the flight or fireworks that contains hundreds of angry spiders (!!!)? Want something cooler? What about a propellant that makes it hard for undead to cross the exhaust-line left by a rocket for smart terrain control? Or ones that contain entangling good? What about a glitterdust-y emission of tracer particles? Have I mention condition stacking, damage to adjacent creatures in the flight path? Oh yeah! Oh, and btw. – yes, the pdf has a list of which inventions get the compartment-subtype. Kudos! Editing and formatting are top-notch, I noticed no glitches. Layout adheres to Interjection Games’ two-column b/w-standard and sports thematically fitting b/w-artwork. The pdf has no bookmarks and does not necessarily require them at this length. The last Remedial tinkering-expansion by Bradley Crouch was absolutely AWESOME in that it not only provided great low-level tricks, its combo-set-up potential was thoroughly inspired. Now, one can say pretty much the same for the content herein, with one minor gripe on my end: It quite frankly took me longer than I would have liked to piece together how exactly fireworks are launched – a slightly more concise explanation in the beginning would have certainly helped here. That being said, not only do the fireworks here work how they should and in a mechanically distinct way, they also sport a damn cool array of combo potentials. Now I might grumble a bit here, but then there’s one more thing to consider: This is FREE. It costs zilch, zero, nada, nothing – and who am I to nitpick on a quality, fun and simply interesting expansion that is free to boot? All in all, I’m glad I can now add this cool array of options to my tinkers, though I certainly wished that a) this was longer and b), it explained the process of launching fireworks in a slightly more concise manner. That being said, this is still a great expansion and one that requires literally zero investment from you – well worth a final verdict of 5 stars +seal of approval. You can get this nice expansion for FREE here on OBS and here on d20pfsrd.com’s shop! Sure, I can work on that for Ultimate Tinkering. Any suggestions? Compartment: These are the Compartment-rules. Essentially, explain how the fireworks work and what they require in the subtype and mention how specific launching mechanisms deviate from the standard in the respective entries. You may even get a bit of wordcount out of that. Also, the spider fireworks are a nod to Japan’s plague bomb in WW2, effectively clay shells full of infected ticks. It doesn’t get as much face time as Italian jets, the German V2s, or the American nuke, but it was in play.